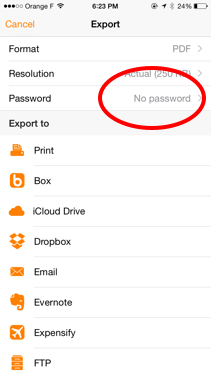 When you export a PDF document, Genius Scan lets you protect it with a password. PDF documents protected by a password are encrypted and can only be read with the password. The encryption used is RC4 with a 128-bits key. If you are rather looking to prevent people from accessing Genius Scan, please check our tutorial on Touch ID/passcode. 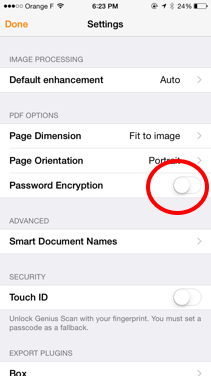 Turn on the PDF encryption switch. Enter a password as requested. 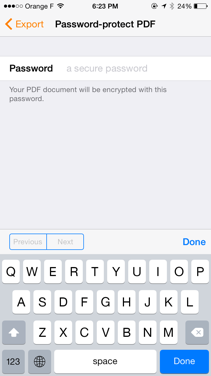 This password will be used to encrypt all the PDF files you export. Make sure that the PDF format is selected. The password feature only works for PDF documents. Tap on the Password field. Enter a password and tap on the back button. 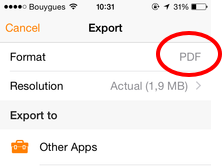 The password will be used to encrypt the PDF you export.